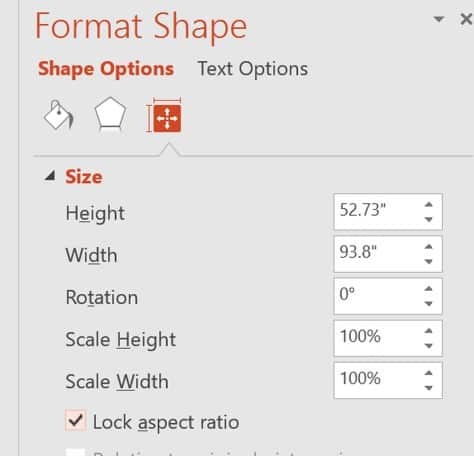 My favorite feature of Office 365 is the Morph transition (yes... it's a PowerPoint transition, not an animation), which is an absolute game changer for working with your PowerPoint animations. This tutorial will show you just one of many different ways you can use. When I first saw this feature pop up in my 365 update, I got so excited I stayed up almost all night making a demo video of a cool Prezi-like effect, shown below. Download the free PDF of these steps here. This is just one of a TON of cool ways to use the Morph Transition for creative animation effects, which I’ll be covering more in the future. For now, let me show you how to make the cool Prezi-like effect you just saw. How to get the Morph transition? To use the Morph transition, you need to have the 365 (subscription) version of Office. If you don’t have it yet, you can get a free 30-day Office 365 trial here. Format your initial slide with text, images, or shapes. Duplicate your slide as many times as needed, moving your picture around. Add the Morph transition to each slide. 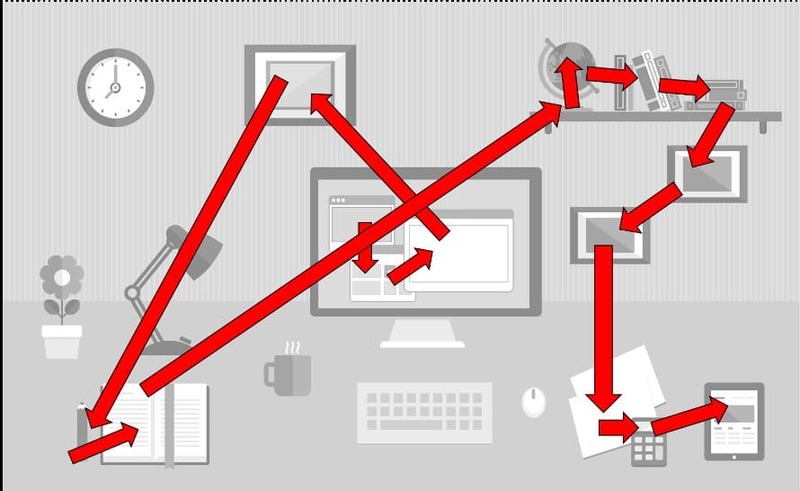 You can download the free PDF of the steps here to build this Prezi Effect in PowerPoint with me. This sounds simple, but it’s actually really important. The picture MUST be of high quality so that you can zoom in and not be worried about pixelation. 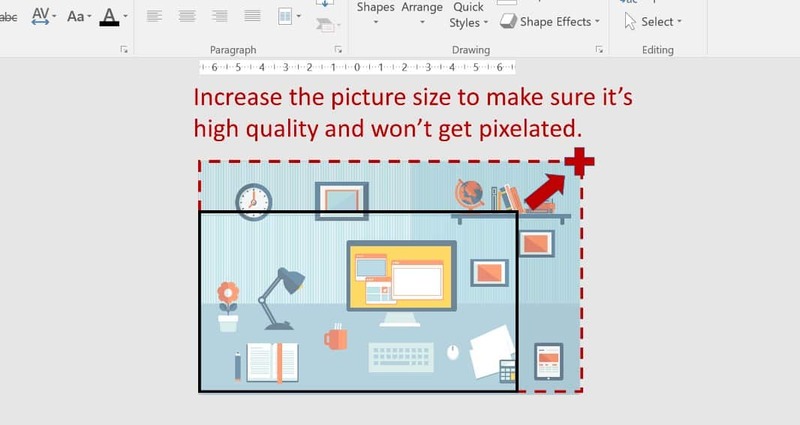 To test the quality of your picture, drag the corners to make it the maximum size you’ll think you’ll use in the presentation (this is how we’ll get the zooming effect later). Then, test it out by viewing in Presentation mode – if it looks good, you’re good to go. Resize it back to normal afterward so you can work through the next steps. If you don’t want to worry about possible pixelation, use a vector image, as I did in my demo. Vectors are images that are made of individual shapes so they can be resized without any loss of quality. Make sure you get vector files with an EMF, WMF or EPS extension. These can (usually) be ungrouped and used as true vectors in PowerPoint. I actually got my vector image from Shutterstock in .EPS form. However, you can get plenty of free (and really nice!) 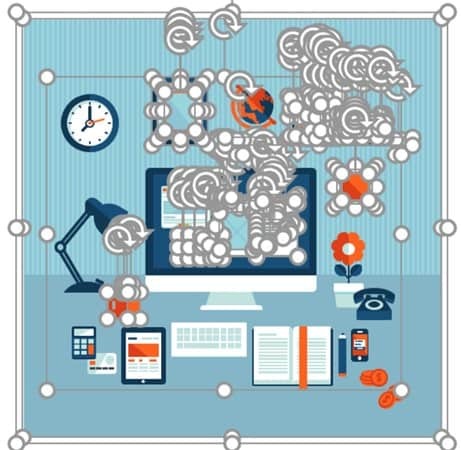 work-space vectors from my new favorite vector site – Freepik. For a larger list of free picture resources, you can check out our recommendations here. Note: PowerPoint 2016 no longer supports the direct import of EPS files, due to security concerns. 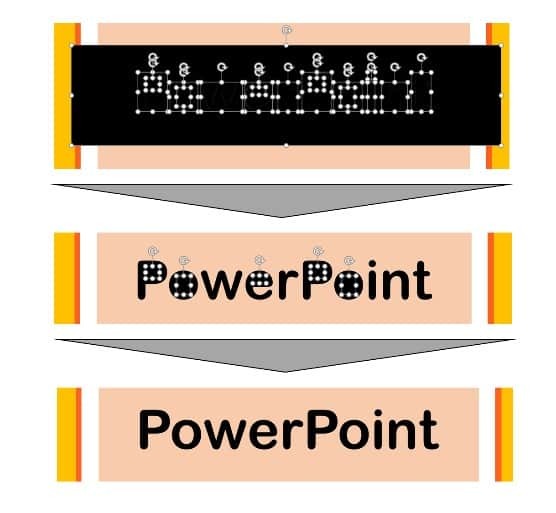 If you want to convert vector files like EPS and SVG into PowerPoint-friendly EMFs, check out this article on importing EPS files into PowerPoint. 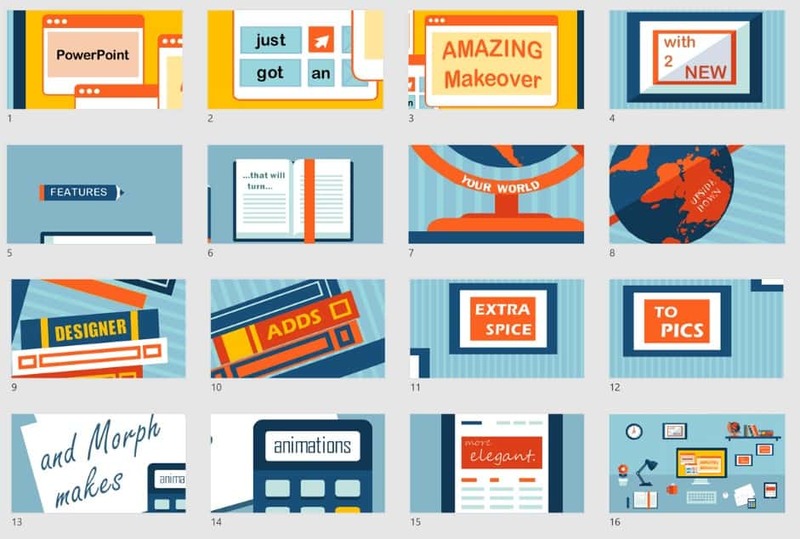 With vectors, you need to ungroup them in PowerPoint to get their full benefit. When I got the photo, I just inserted it into PowerPoint (dragged and dropped in from a folder). I then ungrouped the images by right clicking and selecting Group -> Ungroup (you can also use CTRL + SHIFT + G as a shortcut). I then said “yes” to the pop-up question, shown below. I then ungrouped again by hitting CTRL + SHIFT + G once more. The vector image became separated into its individual parts, which can now be played with. For more information about the group and ungroup shortcuts, see our ultimate guide on How to group in PowerPoint. I actually did a lot of playing – I extended the background and rearranged some of the items in the work-space to better fit the 16×9 PowerPoint template I was working with. Here’s my original picture and how I reworked it. You can see I moved the flower, the book, the pencil, and other things. I also recolored a few things (including the monitor screen). Once you’re done working your image, you now have a “canvas” to work on and can move to adding your words. First off, think about the full message you want to have on your page and write it out somewhere (maybe in the notes section). Then, find ways to shorten the text, where possible – you will thank yourself later! The shorter the text, the easier. 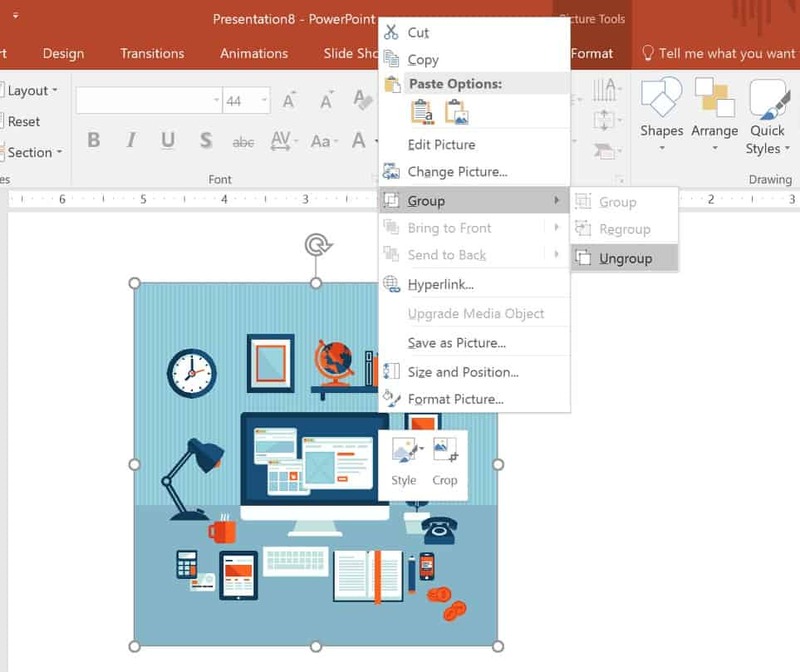 PowerPoint just got an amazing makeover with 2 new features that will turn your world upside down. 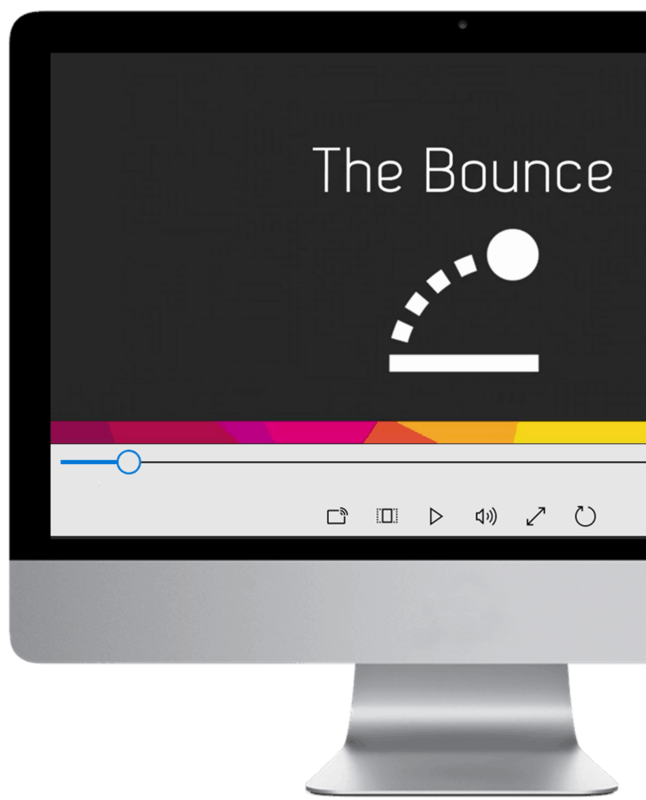 Designer adds extra spice to your pics, and Morph makes your animations more elegant. Just two sentences – and it still takes quite a bit of time to make, especially if you’re just focusing on one or two words at a time, as I did. Now, think about where you want the words to go on the page and the path of the presentation flow. It’s extremely helpful to plan this out in advance before you actually put the text in, since you may find you don’t have enough space for the text or need to adjust objects on the picture to make room. Below is how I mapped it out in my head. Each arrow represents a “stop point” on the picture, which we’ll use later to do the animations. Once you have everything mapped out, we’ll put in the words by inserting textboxes within the picture (then resizing and recoloring the text as needed). This will likely involve a lot of zooming in on your picture so you can see the details and place the text correctly. Here’s what mine looked like with the text inserted. Seems simple so far, but here’s the secret trick to making the text work, which took me a bit of trial-and-error to discover…. Text actually needs to be in vector or shape form – it can’t just be a textbox but must be turned into resizable shapes. Why? Well, what’s annoying is that (in a little bit) when we group and resize the overall picture, everything will resize except the text, which will still remain the same font size, ruining the effect. While you can manually adjust the font size, it’s hard to get that precise (and if you have a lot of text, it’s a pain to do) – trust me, I’ve played with it enough to know! Here’s what it looks like, for example, if you make the picture bigger – everything gets bigger except the text, which now looks extremely small compared to the rest of the picture. Not cool. First, insert a rectangle (of any color) next to the textbox you want to convert. Make sure the rectangle is larger than the textbox. Then right click on the textbox and select Bring to Front. Now slide the rectangle behind it. Finally, select the textbox, then the rectangle, then go to Format -> Merge Shapes -> and Fragment. 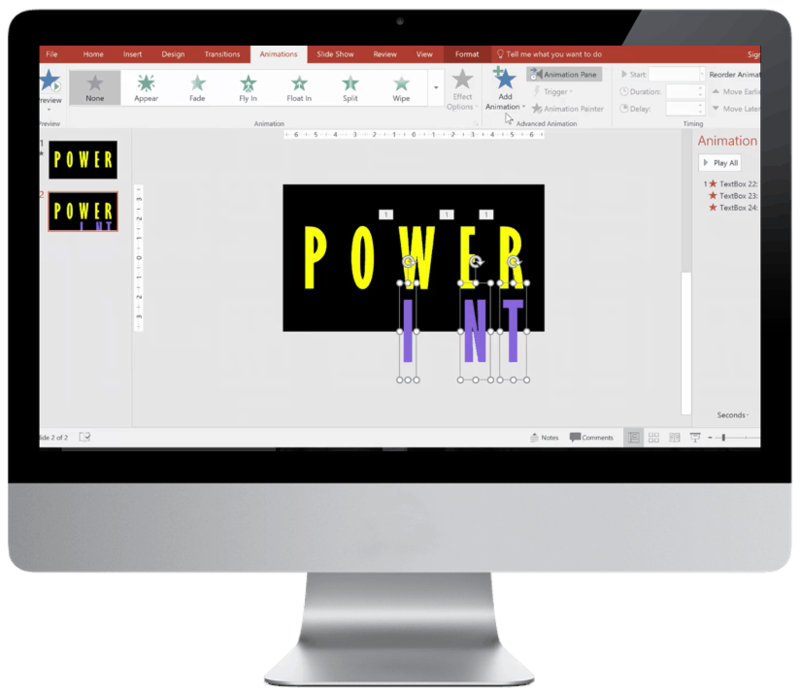 This will turn your letters into vector shapes. You’ll now just have to delete everything around the letters, as I show below. CONGRATULATIONS – you now have vector text (which can be handy for many other tricks too)! Now just repeat this same process with the rest of the text. Once you’re done “vectorizing” all the text, select everything on the page by hitting CTRL + A and then CTRL + G to group everything. As a final touch, you can select the picture, then go to Format -> Size -> and check the Lock Aspect Ratio box. This will ensure your picture retains its proportions when we start to work with it. This is where the Prezi-like magic happens. Basically, you put your picture on the first slide in the position where you want your sequence to start. I chose to start by zooming in on the monitor that says “PowerPoint.” For this, I had to make the picture really large in size. Below, you can see where the slide is and all of the other parts of the picture that don’t show (the greyed out area). After this, you just keep duplicating your slide (CTRL + SHIFT + D) for each new “stop” in your presentation flow. On each new slide, you move, rotate, or resize your picture as you like to make the next text in the sequence show. 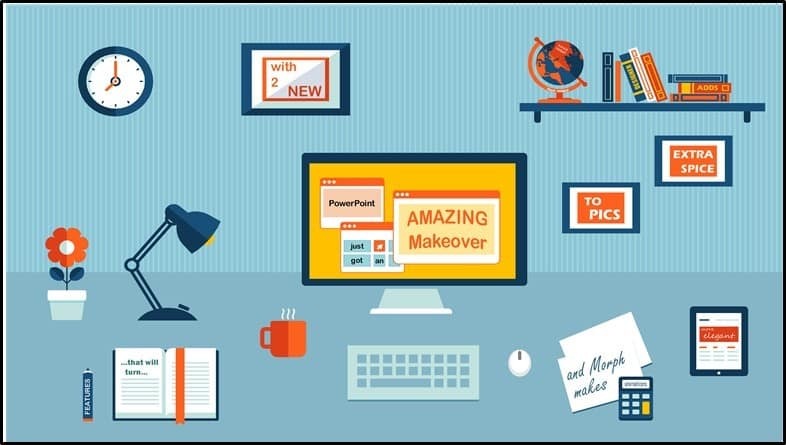 The more pan, rotation, and zoom you incorporate, the more it will look like Prezi! Here is what my slides ended up looking like (from Slide Sorter View in PowerPoint). As you saw earlier, each of these slides shows just a small piece of the picture – the rest is outside the slide and not seen. Finally, add the Morph Transition to all the slides by selecting all of them, then going to Transitions, Morph, and making sure the Effect Options is set to Objects (the default setting)…and you are done! Now just go into Presentation mode and watch your animations come to life! The first time you try it, I promise you – it’ll be a truly amazing experience. 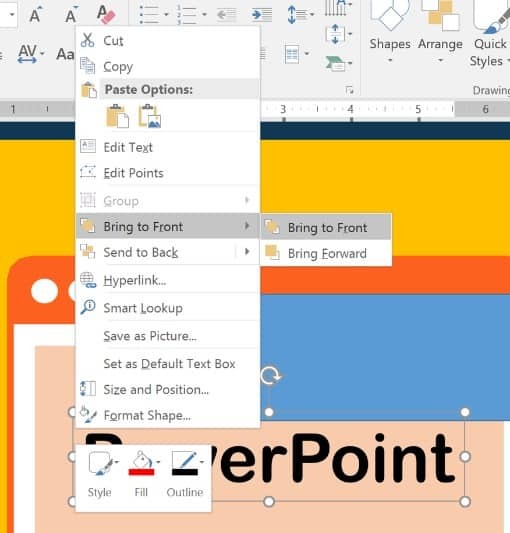 It’s like nothing we’ve ever seen in PowerPoint. Maybe you’ll even be inspired to pull your own near-all-nighter to make a demo video! Well, hope this was useful. Let me know if you find your own cool tricks with this Prezi-like effect or other cool effects with the Morph Transition in PowerPoint. Now go out and have fun with it! 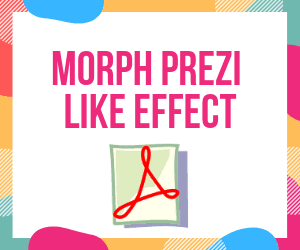 Where should I send this Morph Prezi-like Effect PDF, so you can follow along and use them in your decks? It's 100% FREE.